We are finally here in Tucson and all set up. I had hopes to blog from the road, but we hit some ice storms and the thought of capturing such misery was beyond my capabilities. Luckily before we hit the ice storm, we were able to spend time with Greg's sister-in-law, Stacie. She lives with his brother Mike in Memphis. We had a wonderful time hanging out with her. She took us to The 5 Spot which is a small, neighborhood restaurant behind what used to be an old brothel called Ernestine and Hazel's. The meal was delicious. My scallops with sun-dried tomatoes over pasta was tangy and good, but I'll know for next time to get the shrimp and grits. I had a bite of Stacie's and the grits were supremely creamy, smooth, and the perfect accompaniment to the supremely tasty seafood. The cool thing was that we were given a tour of the entire place, including the ghost-invested upstairs. Across the way was The Cheesecake Corner. It was delicious. I got a slice of rum-soaked coconut cheesecake that was divine. We hung out and stuff ourselves silly with cheesecake while watch the State of the Union Address. While Greg was driving, I was able to finish up wire-wrapping some special, one-of-a-kind pieces for the shows. The glass baubles were featured in Cynthia's book, Enchanted Adornments: Creating Mixed-Media Jewelry with Metal, Clay, Wire, Resin & More , and were made by the talented Shannon Hill, who passed away last year. They are like time-capsules, preserving an original drawing by Cynthia with bits of stones, mica, and twigs. I adore these sweet baubles capped with PMC. I wasn't able to work much though on the road. As I mentioned earlier, we eventually hit an ice storm and had to drive through snow, freezing rain, ice and all manner of unpleasantries. We spun off the road, got stuck and had to be rescued by passing by trucks, and dealt with the slow going 15 mile per hour trudge. We got stranded in Amarillo, Texas the weather was so bad. Eventually when the snow stopped the next day, we took the some-what clearer roads south through Texas. As we came up to Odessa, Texas, most of the signs of the horrible weather were behind us and it was clear skies with a warm sun – just what I needed! We arrived in Tucson just after the sunset. I am smitten with the house. The owner appreciates well-made things and that's represented in its furnishings and decor. It is sprinkled with all kinds of vintage goodness and many owl friends. I made lunch yesterday and it was phenomenal. I sauteed a fillet mignon steak, whipped up a fresh salad, and toasted some crostini. I made a homemade béarnaise sauce and a quick lemon dressing made from meyers lemons right off the tree. We ate out on the deck, and I admired the succulents and view of the pool. It is such a delightful treat to eat OUTSIDE with the sun on my face. Back in Bolivar, this would be an impossibility unless you were looking to get frostbite. After lunch, we shopped for wooden bowls and unique planters. I plan to stock up on succulents for my window garden while I'm here. The planters were just what I wanted. I felt very effective, crossing things off my list. When we were done running around, she dropped me off at The Doubletree Hotel to help set up the booth at the To Bead True Blue show that opens in a couple of hours. It was interesting to set up a booth after having not done it for a month. Eventually the old patterns fell into place. Above is a picture of the new pewter pieces. They look fabulous! We'll also be getting a bunch clasps done in cast bronze on Tuesday! The table is laden with all kinds of treasures – lots of pewter, shibuichi, silver, bronze and copper from my family at Green Girl Studios, lampwork glass, books by my sister Cynthia, ceramics by Off Center Production, and we'll have polymer goodies from Heather Wynn on Monday. I am so excited about our shows! Cynthia and I were working until the wee hours of the morning, suffering with burning red eyes and exhaustion, but it all paid off! We finished up some treats just for the Tucson show! Above are three new charms. Aren't they cute? They are made out of pressed PMC and are TINY! The owl is smaller than a dime. They'd be perfect for earrings or for doll jewelry or used on a charm bracelet. The pressed out pieces have been patinated with liver of sulfur and all hand-buffed to bring out some of the silver and add a little contrast. They'll be retailing at $6 each. We'll also be having new pewter designs. CLICK HERE to go to Cynthia's blog to see the masters of the new pewter designs sculpted by her and Greg. AND! We'll be featuring work on our table by Off Center Productions, Kelly Russell and Heather Wynn! So definitely stop by to say hello and to check out ALL of the lovely little goodies. The delightful, Jill MacKay sent me some bezels from her new line from Darice Inc. to experiment with. I was really impressed with the craftsmanship and how nice the sterling silver bezels were. One of the distinguishable perks is that these bezels have nice, high walls. This is perfect for all manner of goodies to be embedded or to have multiple layers of resin poured. Below are a few of my experimentations. I wanted to add a little bit of color, but still retain the arabesque lattice-work design in the background. I used vintage sequins from Gail Crosman Moore. Since the sequins are slightly cupped in shape, it's tricky to get them embedded without trapping a lot of air-bubbles. The secret is pouring a layer first, then sprinkling the sequins in, and then topping it off with another layer. Using a tooth pick, I was able to flip around the sequins in the resin, releasing any air-bubbles. I like how this turned out, even though it turned over very different than I had imagined. I sprinkled in vintage simulated pearls and some Swarovski crystals. You might ask yourself, "Where are the Swarovski crystals?" Good question. Apparently after being submerged in the resin, the crystals seem to disappear. I imagine it has something to do with the refraction of light and how the facets are embedded in resin, but I'm not sure. If you look really closely, you can see the most subtle color differences sprinkled throughout from the black diamond Swarovski crystals. I'm going to try to half-way embed the crystals next time. Even though it didn't turn out quite how I imagined, I do like how the pearls look like some kind of enchanted fruit on the vine of a magical plant. For those that love Steampunk, these are perfect! I could stack and layer watch gears and cogs all day. Ideally I would have had some of the underlying design motif to come through a little more, but unfortunately knocked my carefully stacked parts over while pouring the resin. Really, the possibilities are endless! I definitely recommend Jill MacKay's new line of bezels. They're a versatile set of components perfect for customization. Required FTC Disclosure: These items came free of charge. I was not paid by Jill MacKay or Darice INC. for my honest review of their products. Yesterday, the delightful Kathy Van Kleeck stopped by for a quick visit. It is always nice to see her. I love her sense of humor and admire her talents. Kathy came by bearing gifts! Ever since my last trip down to Asheville, I was thinking of a way to get one of her pieces. I adore their heartfelt sentiments and all the tiny personal touches that go into her jewelry. Above is a picture of the piece she made just for me! Aren't the luckiest kid on the block? It's hand-braided silk with a blessing rolled up on the side with amethyst and cyanite and a hand-stamped fine silver charm. The charm reads, "Simplicity Always". If you've ever received correspondence from me, then you know that this is how I sign my letters. I've signed all my letters and emails like this for over a decade. It's a mantra I like to live by and doesn't necessarily mean exactly what it overtly implies. To me, "simplicity" is like a state of grace – it's not necessarily simple or easy, but done in a manner which seems effortless and natural. A tight-rope walker makes it seem so easy to balance on a thin wire, but we all know it takes a great deal of concentration and effort not to come tumbling off. It is my affirmation to live gracefully and with purpose each day – each moment. I was fortunate enough to participate in a "jewelry redux" assignment that will appear in the next issue of Stringing Magazine. The article was penned by Michelle Mach. 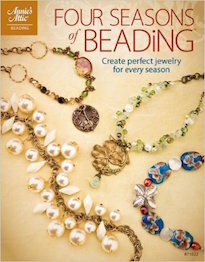 CLICK HERE to check out her Beading Daily post, where she reveals seven tips for redesigning jewelry. You might have noticed that at the end of my last blog post, I included a "Required FTC Disclosure". Let me start of by saying that I'm completely against this. I think it's a violation of personal civil liberties outlined in the First Amendment. Any dilution of the Freedom of Speech is bad news. Not only does it violate Freedom of Speech, but it also invades privacy, presupposes jurisdiction over the world wide web and personal opinion, and is a huge waste of time to have the government monitor who's being naughty and who's being nice. The only reason why I'm in compliance with the new FTC Regulations is that I don't want to have the sponsors of the products I review penalized or fined. And really... I don't want to be fined either. Keep in mind, if you don't play nice, you could get an $11,000 fine! If you'd like to find out more about the new FTC guidelines CLICK HERE. Valentine's Day is quickly approaching and the fine folks over at Artbeads.com sent over some goodies to play with. The result is my humble offering, "Not Without". I was asked, what does "Not Without" mean. In essence, this double-negative means that you are always loved. You are not without love. In making this piece I used 8mm Swarovski crystal rounds, 12mm Swarovski crystal margarita sequins, 6mm Siam Swarovski crystal margarita sequins, an elongated heart-shaped copper-plated bezel, copper chain, natural brass filigree, gunmetal chain, and a sweet heart lobster clasp. When I was working on the focal, I knew that the proportions of the heart were too large for a single butterfly filigree piece, so I used two. The lacy pattern of the stamped out brass adds a touch of delicacy and "light-hearted" romance. To do this, I carefully removed the excess and brought out the power tools, attaching the filigree pieces to the heart bezel. I then added a collage I did using painted vintage papers. Once the glue was dry, I filled the bezel in with ICE resin. I wanted the piece to have a lot of movement, so I made a bunch of copper headpins and used those to create wire-wrapped dangles with the Swarovski crystal sequins. The crystals were perfect to add sparkle and bright, ruby red color. These were attached to various links of chain. I think the dark gray-black of the gunmetal chain gives this heart piece a little bit of an edge to it. Required FTC Disclosure: These items came free of charge. I was not paid by Artbeads.com for my honest review of their products. Is there such a thing as social networking jewelry? 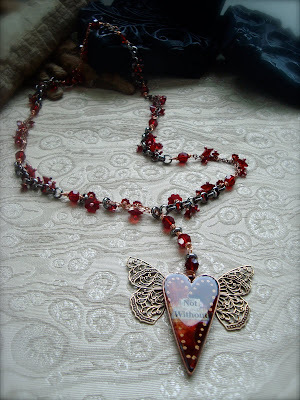 Lisa dug through a bag of Necco valentine candy hearts to create a one of a kind "twittery" necklace. Catch up on the latest jewelry related podcasts. Tammy found some excellent ones for you to listen to. Do You Rock? Here's your chance to show others that you do! Carmi has an easy idea to thank a sponsor. An Emily Dickinson poem describes Cindy's newest piece of jewelry. Jean reviews Kerry Bogert's wonderfully whimsical new wirework book, Totally Twisted. How do you feel about using inexpensive materials in your designs? Chime in and let your voice be heard! Want to know what rubber duckies and Autism Awareness jewelry have to do with each other? Check Jean's site out! Andrew shares the new additions to his bead stash - goodies from Cindy Gimbrone, Diane Hawkey, and Nancy Schindler. A big thank you goes out to everyone who has already placed an order during this sale. THANK YOU! I'm including extra goodies in each order to express my gratitude. Also, for the last five hours of the 36 Hour Tooth Fairy Sale, receive 10% off all items in my shop using the promotional code, "YANK". Remember the sale ends TONIGHT at 2 AM (EST)! Earlier today, I was cleaning out the studio. It seems like this is one task that I am always doing. I am always trying to find the perfect space to freely create. With this particular new space, I think I need to edit down the visuals. In my last studio, it was crazy small and somehow it felt right that I should make it into a nest of images, art, and warmth. The new space dictates that I remove a lot of what I had crammed in before. While I was working to get rid of things, I came across a box filled with pictures and books and various mementos from my past. I realized that one of the books was actually my journal. I had cleverly removed the binding off of a random book and put my own pages inside. I thought this would deter any prying eyes and protect my most valuable ideas. You know, I'm nothing like I thought I'd be. I found a map I drew out of my future and realized that I've pretty much ignored it completely. In this imagined timeline, I already own my own gallery. At the time I wrote that, I was throwing art parties in lofts in Brooklyn with Indie bands and local artists. If I had kept the momentum up, maybe I would have... who knows? I found a book of matches tucked in between some of the pages. It had the name of a deli in SoHo. I remember this book of matches well. At one point, one of my biggest aspirations was to become the world's next biggest Art Star. Whatever that means, I don't know, but I wanted it. I even auditioned to be on a reality television show called, "Art Star." The show never really took off. Although it was in the vein of Project Runway, it was a Deitch Project and the focus on the artists seemed to be diverted towards the gallerist and his achievements. After standing in line for hours in the cold, my portfolio was briefly flipped through without much consideration. I could hear them whispering about their lunch orders. I was so disappointed and angry that I had wasted so much time that I marched over to the deli and got a book of matches and tried to set my portfolio on fire in front of the gallery as a sign of protest. I figured that if they wanted sensationalism, then I would give them SENSATIONALISM! It was too cold and slightly drizzly and the portfolio never caught. Each time I struck a match, it just went out. I look back on that moment and count myself lucky. What would have happened if I had gotten on the show? Or if my portfolio had gone up in flames and caused me to be arrested? 15 seconds of fame? 15 years of prison for arson? In the book, I found a lot of ghosts of what could have been. A list of baby names... an itinerary for my trip to Europe... postcards of shows I wanted to see... leaves from trees now gone and long fallen... a drawing of a future that never happened. Things didn't turn out the way I had imagined them. I could be haunted by the ghosts of things that never were, but I'm happy in my own way. Things are far from perfect, but I've found my peace in this struggle. I've just uploaded a bunch of new stuff to the sale section of my shop. I've got a bunch of loose components AND finally some finished jewelry all at drastically reduced prices. Many of the items are going for a pittance of what they were originally acquired for. Today at 2PM (EST) the 36 Hour Tooth Fairy Sale begins! I had thought about calling it the 36 Hour Exploding Tooth Sale, but thought that it had too many negative-KGB-cyanide-suicide-tooth-capsule connotations. Instead I'm focusing on the whimsy of the Tooth Fairy image to carry me through this funk. In any event, the items in the sale section of my shop will only be available until Friday evening (or rather Saturday early in the morning) at 2 AM (EST). I will then take them down and pack the orders up with wild abandon to drop them in the post before my afternoon flight. CLICK HERE to visit the sale section and take a look. Save on top of the savings by using the promotional code "TOOTHFAIRY" at the time of checkout to receive an additional 5% off of everything in the shop. This code will also expire at 2 AM Saturday morning. Make sure to drop by the shop, because I've added lots of goodies – the kind of goodies that won't rot your teeth and require the services of the "real" Tooth Fairy. In these four bracelet designs, I've used a wide variety of materials. I used clasps and spacers from my family at Green Girl Studios, polymer from Pam Wynn and Christi Friesen, ceramic from Keith O'Connor, resin from Natural Touch Beads, lampwork glass from Patti Cahill of Dyed in the Fire, Leila Garras of Maebeads, Debbe Hull of Coast to Coast Beads, and Bronwen Heilman of Ghostcow, chain from Ornamentea, Swarovski crystal pearls from Fusion Beads, stones and pearls from Talisman Associates Inc. and Bead Trust, and silver and bronze from Saki Silver. Determined to beat this funk, I've decided that I'm finally going to do an art project that I've had scribbled in my sketchbook for years. The details will remain vague until it actually happens. For now, I need twelve volunteers. Please leave a comment to this post and then send me an EMAIL with your snail mail address. Don't forget to do both steps; the former because it helps everyone keep track of how many people at any given moment are participating and the latter because it's essential to the project. If you're uncomfortable giving out your snail mail address, then I'm sure that I'll do another project in the future that won't require it, but for this particular project it's a must. Thanks so much in advance! Time is flying by and it's not necessarily because I'm having fun. Most of my time recently has been spent in a funk. I'm in a rut. No, more like a trench. I've tried not to spread this around, because really, it doesn't do anything. I'd rather be positive and focused on making things, but it's difficult. The biggest source of my funk is, of course, the issue with the banks and Yury the Ukrainian. It is taking a tremendous amount of effort to get things straightened out. The most I can do is to wait. I have to wait for pending charges to post, for customer service to pick up, for new cards to arrive, for money to go out, for money to go in... it is just frustrating... waiting. I don't know if it's a result of all the scowling faces and gritted teeth of late, but one of my teeth in the back needs plucking. The nerve is exposed and it makes eating an ordeal. My tooth cracked years ago on the day Reagan died. Coincidentally I cracked it on a jelly bean. I should have gotten it fixed then, but I didn't have time then. I was always too busy. I can't ignore it anymore though, but now a trip to the dentist isn't in the budget and I don't have dental insurance. Sure, the tooth hurts, but what really hurts is the foreknowledge that if something serious were to happen, I'd be up the creek without a paddle. I guess that's the price one pays for the freedom of a freelancer. On Saturday I take off for Asheville. I am worried that I won't get everything finished that I had planned to, but I guess you just have to make allowances. I am only human. I can only do so much without wearing myself out. And as I've recently discovered, I'm more fragile than I thought. One false move and I could tumble this precariously stacked house of cards. After a few days in Asheville spent with the babies, packing for the shows and hopefully doing some bronze and copper clay pressings, Greg and I are driving across country to Tucson. It's the only way we can get everything we need for the shows there without having to spend a fortune on shipping and worrying that something might not show up. It'll be good to get away for awhile, step back and just lose myself in the pace of the shows. I'm looking forward to the warmer weather, shopping, and spending time with my creative friends who I only get to see a handful of times a year. While there, we'll be featuring the work of some excellent people who can't make it this year, like Kelly Russell, Off Center Productions, and Heather Wynn. I'm excited about these additions to our table. I think the work of all of these artists goes marvelously with Green Girl Studios merchandise. While in Tucson, I'm also hoping to meet up with Ellen Steiber, author of A Rumor of Gems. I became acquainted with her work while I was doing research for one of my articles on gemlore and faeries. Hopefully we'll get to sit down and meet face to face. Back to work for me. There is still yet a mountain of work to do before I can go and I've still got a couple more hours of solid work before rest. It's been chilly and drizzly here lately. (This is an improvement over the snow and ice.) To keep warm and feel comforted, I decided to whip up a quick midwinter meal. I first started by boiling the potatoes in salted water. Next, I fried up some bacon and used the pan drippings and bacon fat to brown some seasoned boneless chicken breasts. I placed them in a baking dish. I then caramelized some onions and layered them overtop the chicken breasts. I deglazed the pan with some apple cider vinegar, chicken stock, soy sauce, and apple juice, added the liquid to the baking dish, and popped it in the oven (covered) for 45 minutes. While the chicken was in the oven, I drained the potatoes and smashed them. Once they were smashed, I added some milk, butter and the bacon. The chicken came out perfectly tender, juicy and flavorful. The potatoes were great because they helped soak up some of that beautiful liquid that reduced a bit in the oven. It was a great meal on a cold winter night. A couple of packages found their way to me on Friday, but with the whole debacle with Yury the Ukrainian, I haven't had an opportunity to dig into them until today. Opening up these packages was definitely a bright spot in a couple of dreary days. The first package came from Cindy Gimbrone AKA the Lampwork Diva. Inside were five lampwork glass beads that look very much like juicy cherries. I can't wait to use these. I picked them up from Cindy during her sale for a song. 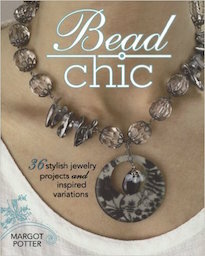 I met Diane Hawkey in Milwaukee at a Bead Blogger Breakfast. It was a good time and it was great to come face to face with a lot of folks that I only communicate with over the net. I just love how quirky and sassy Diane was. She had me giggling the whole time. Later, at the show I had been meaning to drop by her table, but couldn't really leave the booth, so I missed my opportunity to stock up on her goods there. Luckily she has a website and I placed an order with her. The owl, raven, forest spirit and bird are apart of her current line, but the skull tube at the top of the picture is new. I have been on a skull kick and requested one from her. She had sadly just lost a friend and had oddly enough been working on designs from old New England grave stones. The result is her new Memento Mori line. Isn't it great? I think I'm going to string up a necklace for myself using this lovely. Speaking of ceramics, I also have a package from Gaea that I'm looking forward to getting into. So, not all has been bad lately. These little things have brought me a little bit of happiness. Not so much because they are objects to add to my horde (which would be excuse enough), but because these artist made goods are full of potential and are totally inspiring. My hands itch to create as I hold them in my hands. I really think Barb Switzer is a super person and editor! 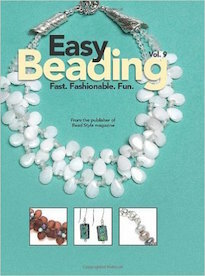 I was thrilled when she interviewed me last year for the online newsletter, Simply Beads! January's Art Bead Scene Challenge is a snowy landscape with a solitary magpie painted by Monet. Carmi has a special Paris post on photographing jewelry. Lorelei tests the waters with some new bead elements from Pork Chop Show. Rewind: Cindy's Art Noveau inspired Stile Floreal bronze clay pendants. Cyndi wants to know, wanna be facebook friends? 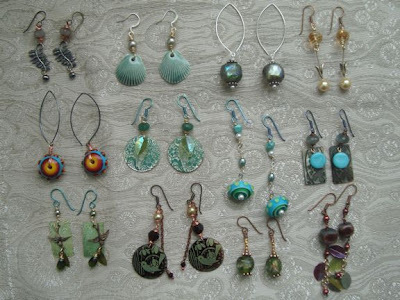 See pix of Katie's workshop offerings for the Bead & Button Show in June. Registration opened this week and classes are already filling up! 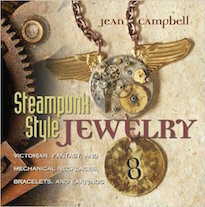 Barbe will be tooting Jean's horn for her new book Steampunk Style at CHA. 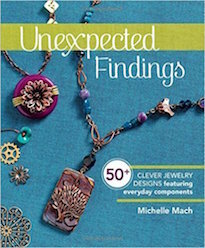 Unraveled star beads become springy coils in Lisa's wintery white dangly earring project. Tammy has developed a quick link list to help you find the jewelry info you need. Melissa has a fun time exchanging bead stashes with a friend to create a new bracelet. A big THANK YOU goes out to everyone who participated in my little giveaway to generate support for my friend and fellow artist, Iviva Olenick. She makes the most beautiful work and I wish her the very best of luck in the competition. The randomly selected winner of the necklace is: Mel Mel. Please send me an EMAIL with your snail mail address and I'll drop it in the post. Thank you for your support! For those of you who were not lucky enough to win the necklace, I still want to thank you for your support and for your votes. Please also send me your snail mail addresses and I'll drop a little present in the post for each of you to show my gratitude. Thank you! OH! Although this giveaway is completed, the competition is not over yet. Hopefully you love Iviva's work as much as I do and will continue to vote daily! CLICK HERE to vote. Today has been a pretty nasty day. All day I've been trying to deal with the bank and with the lovely merchants who I've bought from or have automatic transfers with who can't get their money. I'm the one that feels like a criminal even though I didn't do anything! To top it off with a cherry, the bank has been less than helpful! All day I've been transfered around, bounced from one unhelpful person to the next. I happened to finally get help, but it was during their maintenance hour and they couldn't access my files. Call back later, they said. And when I did end up talking with someone again... apparently I have to sign and return an affidavit stating that the charges Yury the Ukrainian made were not mine. One snag... the file format that they sent it over in is one commonly used for phishing! My computer won't access it. Isn't it ironic that the bank is trying to use the same format as Yury the Ukrainian probably used to steal my information in the first place? I was also told today that I needed to go to the local police department and file charges against Yury the Ukrainian, but not to expect anything to happen since he's overseas. He will probably continue stealing people's credit card numbers and buying hoochie clothes. Needless to say, I've been having one heck of a bad day. I've tried to stay positive, focus on my work, and really made an effort to be as cheerful as possible through this ordeal. But I'm worn out. Right now the only thing that is giving me some semblance of peace is the idea of going to the Ukraine, finding Yury the Ukrainian, tasering him in the gonads and then going antique shopping. Right now, that thought is the only thing keeping my eyebrow from twitching off my face – justice and finding good deals. I would happily indulge in retail therapy, but wait, oh that's right... I can't... because my account is still over-withdrawn and I canceled my credit cards. Sorry to complain and whine. I'm just venting. But, if you'd like to take advantage of my bad day, feel free to stop by my shop and use the coupon code "BADDAY" and receive 5% off your order. I'm taking down all of the current items in the sale section tonight. I'm in need of a good purging. So if you want something from there and at the drastically reduced prices that they are now, make sure to swing by before I take it all down. Here's my latest necklace. I've titled it, "Champagne Waves". I was deeply inspired by the Champagne colored dichroic glass and the shibuichi Forever Beautiful Mermaid coin from my family at Green Girl Studios. I wanted to capture the warmth of color, but retain a light effervescent feeling. I've done this by using a Swarovsky crystal and crystallized pearls from Fusion Beads, chain from Ornamentea, pearls from Talisman Associates, a toggle from my family, a glittering and beautiful dichroic glass bead, and a shibuichi link from Saki Silver. Above are a couple different images of the piece. I think it's whimsical and fun, but still is pretty elegant and sophisticated. 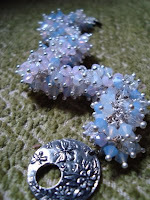 I was just notified that I am a semi-finalist for my Crystal Caterpillar Bracelet in the KGI Worldwide Design Contest! What a lovely surprise! I've entered the contest every year since its inception and have had the honor of making it to the semifinalist round each time. Who knows, maybe this year I might win big? If you're in Tucson this year for the gem shows, drop by the K. Gottfried booth at the Tucson Bead Show to vote. The votes taken there will go towards selecting a winner. I am so completely beyond frustrated right now. Earlier this evening I tried to make a donation to the earthquake relief fund for the current situation in Haiti. Out of curiosity, I checked my bank account before I made my donation. What I saw made my eyes bleed. Somehow I was negative a thousand dollars!!! ONE THOUSAND DOLLARS NEGATIVE! Apparently Yury Chumak Zaporizka of Chernivtsi, Ukraine (whose phone number is 380 508 580 440) decided to go on a spending spree on my dime! Multiple charges for luxury clothing were made plus some suspicious ones from Nevada and a spa supply company in Florida! This stranger stole my identity and my money!!! My entire evening has been spent trying to sort through this mess... sending out fraud alerts, talking with bank representatives, changing passwords, canceling credit cards, and trying not to lose my mind in the process. UGH! I'm a big fan of my friend, Candice Wakumoto, and her work! Candice is an artist based out of Hawaii who combines fabrication with metal clay to create one-of-a-kind fine art jewelry pieces. Her work is sophisticated and polished, truly provocative and edgy. She also makes the most phenomenal cast charms, which I carry in my Shop. I've just restocked the shop with some of my favorites and added eight NEW designs. Some of the new additions are made of sterling silver and the others are made of bronze. One day I hope to provide the entire collection and am slowly working on that. CLICK HERE to take a trip over to the shop to peruse these mighty fine charms. I don't leave the house very much these days. The thought of going out into the frosty air and trudge through the snow is violence against my psyche and mind that I simply cannot commit. I don't mind though. I like being being huddled up with my work. Some are prone to cabin fever; I'm not. I could be holed up for months, never leaving, and be perfectly content. This is not as solitary as it may sound. Being connected to the internet enables me to keep in touch with nearly everyone I need to. I've also gotten some goodies in the mail. I wrote on my Twitter and Facebook account that I thought "Santa forgot my carnivorous plant jungle." Not long after, I received an unexpected package in the mail! Looks like Santa didn't forget after-all! I got a plastic terrarium filled with a Venus Flytrap, a Sundew, and a Sarracenia. Unfortunately one of the plants leaked a little and the muddy water combined with the "snowman pooh" packing peanuts and the invoice was almost completely indecipherable. All I could make out was, "I enjoy reading your blog." Thank you, Mysterious Blog Reader! Please EMAIL me if you were the one to send me the present and I'll drop a thank you gift in the post for you. After the End of the Year Super Sale, I decided to treat myself to a little present of my own. I got a Brown Violet butterfly print from the skilled, Greenville, SC-based artist, Annie Koelle. I believe that when you make money off of the work of your hands, part of it should go back to other artists. It's good karma and promotes synergy in the creative community. Annie and her husband's work is striking and beautiful AND budget friendly! Although I believe in supporting other artists, I have to be realistic and can't go hog wild. Luckily there are options for collecting their work without having to illegally sell off vital organs on the black market. I highly recommend their work! Don't forget to check out their blog! Speaking of sales, I'm trying to liquidate all of the remaining items in the Sale Section to make room for new items (BigCartel has a limit of 100 products, even with the best plan). That means that I've slashed the prices even more! Some of the items are over 75% off their original price tags and there are several items up for grabs that are less than a dollar. CLICK HERE to check out the Sale Section. I've been a busy little bee. Above are twelve pairs of earrings that I just finished. I used lots of artisan goodies, including some from Candice Wakumoto, Lillypilly Designs, Patti Cahill, Keith O'Connor, and Gail Crosman Moore. With the artisan made goods, I used Czech glass from Raven's Journey and Pudgy Beads. I also used an array of pearls and stones from Talisman Associates Inc. and Bead Trust. Earwires are from Saki Silver and The Odyssey and Bead Expressions. Deadlines have been swirling around my head like angry vultures. At any moment, in my weakened state, they might swoop down and take a plug out of me. That's the poetic way of saying that nothing really will happen. I mean that in the most literal way. I'll miss my deadline, I won't get paid, and in all likelihood, won't get asked back again. Nothing will happen and will cause a ripple effect of nothing happening for a long time afterwards. For someone who is self-employed as a freelancer, this is a big deal. The self-employed don't get paid sick days. But I felt a twinge in my heart. My fingers itched to tear, cut, and paste paper. My heart swooned for the opportunity to get the paints out. I should have spent time working, but instead... I decided to follow my muse. Pictured above is a photo of a stack of 100 works of art all made by me. A bounty of collages lay before me, made up of layers of paint, paper and ink! When I was in college, I had a professor who would assign a project of doing a 100 works of art in less than 24 hours. It was supposed to free up your creative inhibitions and allow you to break down your personal archive of imagery. The muscles in your body would sing their truest song. So, I summoned up this old practice, because my heart said YES! I felt creatively challenged and swept up by this decision to make. Here are a 100 little pieces of my heart... all saying, "YES!" I feel lighter, clearer and more ready to work. It's strange that something that I wasn't supposed to do, ended up saving me and refocusing my attentions. A BIG thanks goes out to everyone who provided their support and found good homes for the goodies in the Sale Section of my shop! THANK YOU! 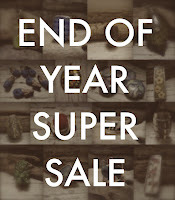 The End of the Year Super Sale is now finished. I did have one load of beads and finished jewelry to post, but I think I'll give it a day or two before I add those items and start dismantling the sale section. I've spent a little too much time in front of the computer lately and not enough time making. So, if there's anything in the sale section that you've been dying to get ahold of, snag it before I take it down. The Shop will continue to go on, and hopefully get even better! I've got some big plans for what's next. If you are looking for some unique findings to use in your valentine jewelry (or Twilight jewelry), Lisa uses some interesting domed filligree pieces to house a bright red mysterious bead. Artfire, Zibbet, Etsy, which of these is the right selling venue for your jewelry? ABS Rewind: Art Bead Scene isn't just about art beads, it's about artist made buttons too! Demon Monkeys appear in Carmi's projects this week. Cindy's made a New Year's resolution to clean out the studio with a January clearance sale! Melanie starts the new year with a new source of inspiration... a project she calls Song Lore. Jean is sharing stories and images this week about her stops in CA. Monterey brought the most creative inspiration of all. Cyndi has started a new series, called "What would you do" to discuss some of the sticky dilemmas we face in jewelry making. Looking for just the right clasp? 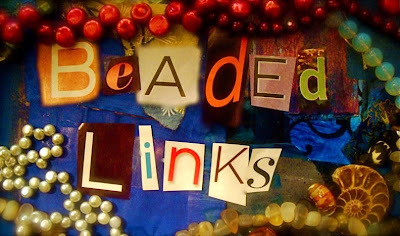 Lorelei reviews a few from Artbeads.com. Jean meets a cool new friend who offers us a great jewelry teaching site! Melissa is the author of Softflex Company's Spotlight On...Article for January 2010. I'll admit it – I'm a bibliophile. It's not as bad as it sounds... well, actually it is. I've got an extensive collection of books in my library and even more still in storage. (While I was moving, the towering mountain of boxes of books made up the brunt of my possessions AND the weight dragging down the back of the van!) That's why I've got to be discriminating when it comes to adding books to the collection. 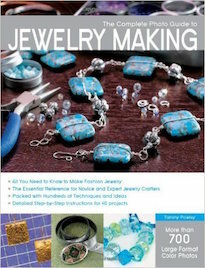 What follows is a very short list of either books on jewelry making that just came out or will be coming out in 2010 that are must haves for the New Year! 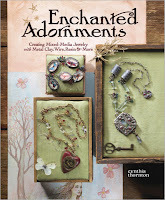 Of all the craft and jewelry books in my collection, Enchanted Adornments: Creating Mixed-Media Jewelry with Metal, Clay, Wire, Resin & More by my sister (Cynthia Thornton) has played the biggest role and has had the greatest impact. It could be because I helped work on the book and have an intimate knowledge of what seems like every page, but it's more than that. This is a good book! Not only is it loaded down with tips, tricks and useful techniques, but it's also entertaining! Along with all of the invaluable practical information, Cynthia has created a narrative story that follows along with each project and is painstakingly illustrated. The book has something for everyone and is as perfect for the beginner as much as it's most excellent for long-time beaders and jewelry-makers. While I was at the BABE (Bay Area Bead Extravaganza) show in Oakland this past November, I had the pleasure of seeing the delightful Christi Friesen. She also had with her some of the new Steampunk creations that are featured in the pages of her polymer and mixed-media sculptural component how-to book. Of course Steampunkery: Polymer Clay and Mixed Media Projects wasn't out then, but I got a good look at some of the inventive and absolutely charming techniques she's incorporated in creating whimsical, mechanical, and futuristic originals. Even with metal clock gears for eyes and seemingly cybernetic prosthetics, her polymer creatures have an adorable, cartoonish sweetness to them. Another great Steampunk book is Steampunk Style Jewelry: Victorian, Fantasy, and Mechanical Necklaces, Bracelets, and Earrings by the talented Jean Campbell. 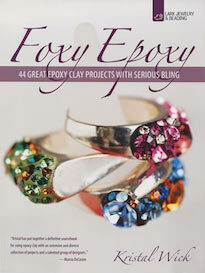 This is more than just a jewelry book! It's loaded with additional content supporting and expanding upon the style of Steampunk. Each facet adds richness and depth to an imaginative and fantastical topic. She also includes designs by a diverse group of artisans, all approaching Steampunk their own way. This is totally a must have item, and I'm not just saying that because I'm one of the contributing designers either! Jean has done an incredible job capturing a movement. Since I discovered the recipe, balsamic/maple glazed pork tenderloin with pears and onions has fast become a staple dinner in my home. It always seems to satisfy. But what happens when it's 20 degrees outside, the snow is piling up, and it's after 9PM (when the local grocery store closes) and you're short some key ingredients? I think every home cook has run into this situation at one point or another. No, the answer is not throw your hands up with despair! In a pinch, you learn to improvise. I was out of balsamic vinegar, short the necessary amount of maple syrup, and only had one pear (thanks to my midnight munchies). But the world was not over. Instead of balsamic, I used apple cider vinegar and a little bit of soy sauce. I then augmented the maple syrup with a little brown sugar, melted butter, and some good old fashioned water. The shortage of pears was an easy fix: substitute apples. Luckily I had an abundance. Mission accomplished! Although not exactly the same, the substitutions were comparable and I actually liked the fruity sweetness that the apple cider vinegar and brown sugar added. The pork was just as tender and flavorful and the sauce was so darn good, I pulled out a piece of bread to sop up all that yummy goodness. With everything that has been going on, I really haven't had much time to sit down and really make anything. I feel a little bit frazzled by this. I am my most happiest when I am making things. Luckily, I have been able to squeeze in a few happy moments and made a fabulous bracelet in the process! What pulls this together is no doubt the dichroic glass focal! I adore dichroic glass. It's like I dipped my hands in the heavens and pulled down a chunk. To accompany the dichroic glass, I've added various types of chain from Ornamentea, platinum-colored Swarovski crystal pearls from Artbeads.com, and a bird toggle from my family at Green Girl Studios. Although extremely rare, I have been lucky enough to procure some dichroic glass for my shop. CLICK HERE to check them out. The bracelet totally developed from the Golden Cloud bead. Beads in the Golden Cloud series have sparkling silver cores, with swashes of water-like blues. Subtle hints of iridescent gold can also be found. Above are a couple of different angles I arranged the bracelet in. I think the different shots give one an idea of just how luminous and magical the dichroic glass are. Ivivia is participating in an artist competition called, Artists Wanted. The winners are selected from popular vote and ratings, and if chosen will receive prizes to help further their careers. Why not help Iviva further her career? Vote for Iviva! You could be a winner too! 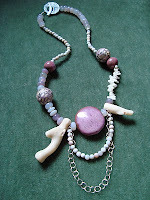 White coral, ocean jasper, creamy chalcedony, raspberry-hued Elaine Ray ceramics, polymer rounds by Pam Wynn, striking silver chain, and a silver toggle from Saki Silver come together to form this summery necklace. I created this piece last year for a summer issue of a magazine that is no longer in print. I really love how organic and asymmetrical it is. It could be your's if you VOTE FOR IVIVA! You don't even have to sign up or send anything out. Just click on the link, hit the stars and leave a comment. SO EASY! CLICK HERE to visit her online portfolio, where you can vote. Don't forget to leave a comment on this blog. The winner will be drawn, Friday, January 15th. Here is a sampling of items in the shop, now drastically reduced in price in the On Sale section. To the left there's a soldered stained glass pendant with real pressed flowers from Lily Studios, in the center is a sterling silver box clasp with carved red rose from Jess Imports, and on the right is a copper-plated aspen leaf pendants. These are just three of the 50+ sale items. CLICK HERE to check out the sale.